Skadi, the goddess of winter, mountains, skiing and bow-hunting, is celebrating her season with an appropriately festive outfit. Her gown is dark for she has been often associated with darkness, the nature’s long rest. It is decorated with glittering snowflakes, the falling sources of light in the night. She might not go skiing or hunting in this outfit, but she kept her arrows near to her, regardless. She’s the sparkle of light in the midwinter night, the sharp bite of frost, the depth of darkness covering her like a cloak. This is an outfit for the wintry goths of strong dark colours with just a touch of silvery light. This is the garb for darker fantasies with a sharp attitude. This is the snowflakes in the blizzard, scathing bite of the breeze. This is the dark side of winter. Both the dress and the collar come with colour-change HUDs of six colours. The upper and lower part of the dress can be colour-changed separately. The collar has also a colour-change option for the shoulder snowflake: silver or gold. The dress is a rigged mesh item that moves with your avatar. It comes in seven sizes: in addition to the five standard sizes there are also two extra ones: XS+ that provides more generous curves in the top part of base XS and M+ that has more muscles and extra curves than base M.
The collar is unrigged mesh and can be resized and re-positioned as you wish. Originally released at Gothmas by Gaslight 2014, now available in the main store and the Marketplace. The special editions are not available anymore. Permissions are M/C/NT. The gown with the HUD L295. The collar with the HUD L195. An animated gif to show the snowflake details better than any picture can. The Cursed sim where Pale Empress is located will be closed for public from December 9th to 15th. This happens in preparation of Gothmas by Gaslight, which will open its doors on December 15th at NOON SLT. The Marketplace will of course function normally during this time and Cursed will be back before you know it! Rose Brooch Gift for Subscribers! Do you want to stay in the know when there’s new fantastic releases in Pale Empress? Join our subscribo! It doesn’t take a group-slot, simply brings you the news when there’s something fascinating and shiny to catch your attention. The brooch is a stunning combination of red roses and white pearls: dramatic, beautiful, romantic and absolutely breathtaking, just like you. Rose Brooch is a gift to all the subscribers: you get it when you join the group, just come to the main store and click the subscribo! 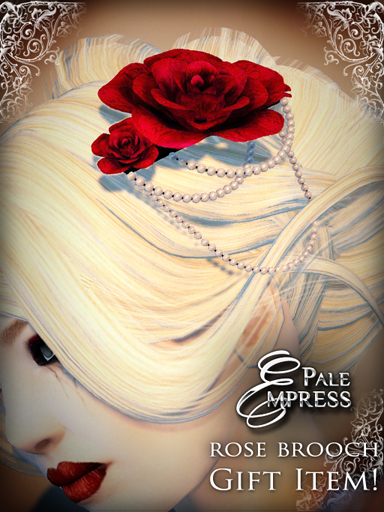 Join the Subscribo in Pale Empress Main Store!